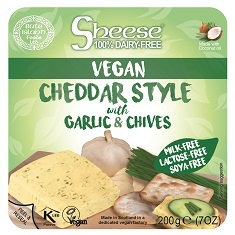 Introducing Cheddar with Garlic & Chives, an exciting new addition to our ever-expanding Sheese range and a tasty choice to add flavour to all sorts of dishes. It’s especially good in toasties, because as you no doubt have already seen with our other varieties, Sheese melts really well. Why not also try as a change on your dairy-free pizzas, or perhaps for a flavoursome and enticing topping on a Sheesey pasta dish? Need a tasty sandwich filler or something to go with crackers, perhaps as part of a “cheese” board? Well, we’ve got it covered! So watch out for it coming to your local supplier, for making delicious meals that all the family will enjoy!